With rezoning complete we are moving full speed ahead with Brewery Taproom planning and construction. Plans include many upgrades to the Farmer’s Market area and exterior of the building; making this a premier site for vendors and customers. 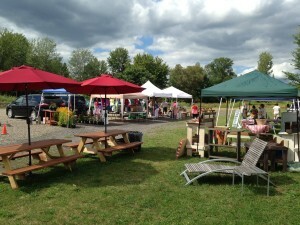 Several vendors have been interested in changing market hours to Saturday afternoons. Yes, Regional Market is Saturday, but many vendors and customers north of the city would prefer to stay local on the weekends. Please let us know if YOU have a preference. Side Track Farmer’s Market on Route 31 in Historic Olde Clay is located on the original site of the old Cigarville Train Station next to the Clay Historical Park. Built in 1921, the original mill provided grain and hardware needs for local farmers and residents. Over the years, many different businesses have called this site home, and we look forward to welcoming you to the Side Track Farmer’s Market.